This exercise is part of the White Badge. You can get a certificate of completion if you complete all the exercises in this badge. This course details the exploitation of SQL injection in a PHP based website and how an attacker can use it to gain access to the administration pages. Then, using this access, the attacker will be able to gain code execution on the server. Fingerprinting: to gather information on the web application and technologies in use. 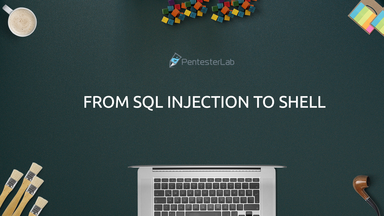 Detection and exploitation of SQL injection: in this part, you will learn how SQL injections work and how to exploit them in order to retrieve information. Access to the administration pages and code execution: the last step in which you will access the operating system and run commands. Fingerprinting can be done using multiple tools. First by using a browser, it's possible to detect that the application is written in PHP. 80 is is the TCP port used by the web application (80 is the default value for HTTP). 443 is is the TCP port used by the web application (443 is the default value for HTTPs). The tool wfuzz (http://www.edge-security.com/wfuzz.php) can be used to detect directories and pages on the web server using brute force. -c to output with colors. -z file,wordlist/general/big.txt tells wfuzz to use the file wordlists/general/big.txt as a dictionary to brute force the remote directories' name. http://vulnerable/FUZZ tells wfuzz to replace the word FUZZ in the URL by each value found in the dictionary. delete information using the DELETE statement. More operations (to create/remove/modify tables, databases or triggers) are available but are less likely to be used in web applications. the conditions following the WHERE statement are used to indicate what conditions the records should meet. The string1 value is delimited by a simple quote and the integers integer1 and integer2 can be delimited by a simple quote (integer2) or just put directly in the query (integer1). As we can see, only these values are returned since they are the only ones matching all of the conditions in the WHERE statement. If you read source code dealing with some databases, you will often see SELECT * FROM tablename. The * is a wildcard requesting the database to return all columns and avoid the need to name them all. Since error messages are displayed, it's quite easy to detect any vulnerability in the website. SQL injections can be detected using any and all of the following methods. All these methods are based on the general behaviour of databases, finding and exploiting SQL injections depends on a lot of different factors, although these methods are not 100% reliable on their own. This is why you may need to try several of them to make sure the given parameter is vulnerable. The value provided by the user ($_GET["id]) is directly echoed in the SQL request. This error message may or may not be visible in the HTTP response depending on the PHP configuration. if you try to access /article.php?id=2-1, the following request will be sent to the database SELECT * FROM articles WHERE id=2-1, and the article1's information will be display in the web page since the previous query is equivalent to SELECT * FROM articles WHERE id=1 (the subtraction will be automatically performed by the database). if you try to access /article.php?id=2-0, the following request will be sent to the database SELECT * FROM articles WHERE id=2-0, and the article2's information will be displayed in the web page since the previous query is equivalent to SELECT * FROM articles WHERE id=2. if accessing /article.php?id=2-1 displays article2 and accessing /article.php?id=2-0 displays article2 as well, it's unlikely that you have SQL injection on an integer, but you may have SQL injection on a string value as we will see. if you put a quote in the URL (/article.php?id=1'), you should receive an error. SELECT * FROM categories where id='1'. SQL allows both syntax, however using a string in the SQL statement will be slower than using an integer. If SQL injection is present in the web page, injecting a single quote ' will break the query syntax and generate an error. Furthermore, injecting 2 times a single quote '' won't break the query anymore. As a general rule, an odd number of single quotes will throw an error, an even number of single quotes won't. It is also possible to comment out the end of the query, so in most cases you won't get an error (depending on the query format). To comment out the end of the query you can use ' --. Since the right parenthesis will be missing once the end of the query is commented out. You can obviously try with one or more parenthesis to find a value that doesn't create an error. Furthermore and ' and '1'='1 is less likely to impact the semantic of the request and the results of with and without injection are likely to be the same. We can then compare it with the page generated using the following injection ' and '1'='0 which is less likely to create an error but is likely to change the semantic of the query. SQL injection is not an accurate science and a lot of things can impact the result of your testing. If you think something is going on, keep working on the injection and try to figure out what the code is doing with your injection to ensure it's an SQL injection. In order to find the SQL injection, you need to visit the website and try these methods on all parameters for each page. Once you have found the SQL injection, you can move to the next section to learn how to exploit it. Now We have found a SQL injection in the page http://vulnerable/cat.php, in order to go further, we will need to exploit it to retrieve information. To do so, we will need to learn about the UNION keyword available in SQL. The most important rule, is that both statements should return the same number of columns otherwise the database will trigger an error. In order to perform a request by SQL injection, you need to find the number of columns that are returned by the first part of the query. Unless you have the source code of the application, you will have to guess this number. SELECT id,name,price FROM articles where id=1 UNION SELECT 1,2,3, since both sub-parts have the same number of columns, this query won't throw an error. You may even be able to see one of the numbers in the page or in the source code of the page. The request above will return the users sorted by the firstname column. The request above will return the users sorted by the third column. Even if this methodology provides the same number of requests for this example, it's significantly faster as soon as the number of columns grow. Now that we know the number of columns, we can retrieve information from the database. Based on the error message we received, we know that the backend database used is MySQL. In order to perform this, we are going to need to replace one of the values in the previous statement (UNION SELECT 1,2,3) by the function we want to run in order to retrieve the result in the response. Make sure you always keep the right number of columns when you try to retrieve information. MySQL provides tables containing meta-information about the database, tables and columns available since the version 5 of MySQL. We are going to use these tables to retrieve the information we need to build the final request. These tables are stored in the database information_schema. concatenate tablename and columnname in the same part of the injection using the keyword CONCAT: 1 UNION SELECT 1,concat(table_name,':', column_name),3,4 FROM information_schema.columns. ':' is used to be able to easily split the results of the query. If you want to easily retrieve information from the resulting page using a regular expression (if you want to write an SQL injection script for example), you can use a marker in the injection: ``1 UNION SELECT 1,concat('^^^',table_name,':',column_name,'^^^') FROM information_schema.columns`. It then is really easy to match the result in the page. The SQL injection provided the same level of access as the user used by the application to connect to the database (current_user())... That is why it is always important to provide the lowest privileges possible to this user when you deploy a web application. John-The-Ripper can be used to crack this password, most modern Linux distribution include a version of John, in order to crack this password you need to tell John what algorithm has been used to encrypted it. For web application, a good guess would be MD5. Unfortunately, the MD5 available is not the format created by the PHP function md5. In order to crack this password, we will need a version of John supporting raw-md5. The community-enhanced version available on the main website supports raw-md5 and can be used. Now we need to provide the information in the right format for John, we need to put the username and password on the same line separated by a colon ':'. This provides an indication that the correct format is used. Once access to the administration page is obtained, the next goal is to find a way to execute commands on the operating system. We can see that there is a file upload function allowing a user to upload a picture, we can use this functionality to try to upload a PHP script. This PHP script once uploaded on the server will give us a way to run PHP code and commands. This script takes the content of the parameter cmd and executes it. It needs to be saved as a file with the extension .php, for example: shell.php can be used as a filename. We can now use the upload functionality available at the page: http://vulnerable/admin/new.php and try to upload this script. you can now access the page at the following address and start running commands using the cmd parameter. For example, accessing http://vulnerable/admin/uploads/shell.php3?cmd=uname will run the command uname on the operating system and return the current kernel (Linux). The webshell has the same privileges as the web server running the PHP script, you won't for example be able to retrieve the content of the file /etc/shadow since the web server doesn't have access to this file (however you should still try in case an administrator made a mistake and changed the permissions on this file). Each command is run in a brand new context independently of the previous command, you won't be able to get the contents of the /etc/ directory by running cd /etc and ls, since the second command will be in a new context. To get the contents of the directory /etc/, you will need to run ls /etc for example. This exercise showed you how to manually detect and exploit SQL injection to gain access to the administration pages. Once in the "Trusted zone", more functionnality is often available which may lead to more vulnerabilities. This exercise is based on the results of a penetration test performed on a website few years ago, but websites with these kind of vulnerabilities are still available on Internet today.